Numerous ÒfirstsÓ in medical research, clinical care, and chemistry are attributed to him, including being the first to differentiate smallpox from measles, and the discovery of numerous compounds and chemicals including kerosene, among others. Edward Granville Browne considers him as "probably the greatest and most original of all the physicians, and one of the most prolific as an author". Razi made fundamental and enduring contributions to the fields of medicine, alchemy, music, and philosophy, recorded in over 200 books and articles in various fields of science. He was well-versed in Persian, Greek and Indian medical knowledge and made numerous advances in medicine through own observations and discoveries. Educated in music, mathematics, philosophy, and metaphysics, he chose medicine as his professional field. As a physician, he was an early proponent of experimental medicine and has been described as the father of pediatrics. He was also a pioneer of ophthalmology. He was among the first to use Humoralism to distinguish one contagious disease from another. In particular, Razi was the first physician to distinguish smallpox and measles through his clinical characterization of the two diseases. He became chief physician of Rey and Baghdad hospitals. As an alchemist, Razi is known for his study of sulfuric acid. He traveled extensively, mostly in Persia. As a teacher in medicine, he attracted students of all disciplines and was said to be compassionate and devoted to the service of his patients, whether rich or poor. Jabir was a Natural Philosopher who lived mostly in the 8th century, he was born in Tus, Khorasan, in Iran (Persia), then ruled by the Umayyad Caliphate. Jabir in the classical sources has been entitled differently as al-Azdi or al-Kufi or al-Tusi or al-Sufi. There is a difference of opinion as to whether he was an Arab from Kufa who lived in Khurasan or a Persian from Khorasan who later went to Kufa or whether he was, as some have suggested, of Syrian origin and later lived in Persia and Iraq. His ethnic background is not clear,and sources reference him as an Arab or a Persian. In some sources, he is reported to have been the son of Hayyan al-Azdi, a pharmacist of the Arabian Azd tribe who emigrated from Yemen to Kufa (in present-day Iraq) during the Umayyad Caliphate. while Henry Corbin believes Geber seems to have been a client of the 'Azd tribe. Jabir became an alchemist at the court of Caliph Harun al-Rashid, for whom he wrote the Kitab al-Zuhra ("The Book of Venus", on "the noble art of alchemy"). Hayyan had supported the Abbasid revolt against the Umayyads, and was sent by them to the province of Khorasan (present day Afghanistan and Iran) to gather support for their cause. He was eventually caught by the Ummayads and executed. His family fled to Yemen, where Jabir grew up and studied the Quran, mathematics and other subjects.Jabir's father's profession may have contributed greatly to his interest in alchemy. After the Abbasids took power, Jabir went back to Kufa. 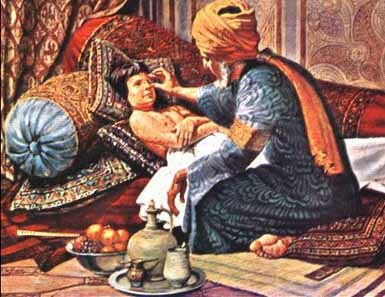 He began his career practicing medicine, under the patronage of a Vizir (from the noble Persian family Barmakids) of Caliph Harun al-Rashid. His connections to the Barmakid cost him dearly in the end. When that family fell from grace in 803, Jabir was placed under house arrest in Kufa, where he remained until his death. It has been asserted that Jabir was a student of the sixth Imam Ja'far al-Sadiq and Harbi al-Himyari, however other scholars have questioned this theory. Razi wrote 184 books and articles, in several fields of science. His books and articles are named by Ibn Abi Asi'boed. 1. Razi was recognized as the best physician of his time who had fully absorbed Greek medical learning. 2. He traveled in many lands. His repeated visits to Baghdad and his services to many princes and rulers are known from many sources. 3. He was a medical educator who attracted many students, both beginners and advanced. 4. He was compassionate, kind, upright, and devoted to the service of his patients whether rich or poor. 5. He was a prolific reader and writer and authored many books.